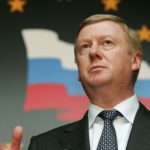 Anatoly Chubais is a Russian politician and businessman who was responsible for privatization in Russia as an influential member of Boris Yeltsin’s administration in the early 1990’s. During this period, he was a key figure in introducing market economy and the principles of private ownership to Russia after the fall of the Soviet Union. From 1998 to 2008, he headed the state-owned electrical power monopoly RAO UES. A 2004 survey conducted by Price water house Coopers and the Financial Times named him the world’s 54th most respected business leader. "You need to find somebody who will speak the same language. We understand that we couldn’t have any kind of discussion without permission, without a legal framework behind it."